Have you ever wanted to take a deck of cards, and make your spectators truly believe that you are perhaps the greatest card sharp ever? David Devlin loves gambling routines, especially Poker deals. This just might be one of the most mind-numbing Poker deals created. And best of all, there is no real technical skill required! It is 99% self-working! Here is the effect: A deck is shuffled, and placed in front of a spectator who is told to cut it about in half. This is done, and it is explained that a four-hand Poker game is going to be dealt. The spectator is asked to name any hand of Poker. Any hand can be called for. There is absolutely no force! Let's say she says, "Full House". Twenty cards are then taken from the spot where the deck was cut; enough for exactly four hands of Poker. These cards are placed in front of the spectator who also shuffles them. Random groups of cards from the twenty are then handed to other spectators for further shuffling. The packet is then reassembled, and the four hands are honestly dealt. The performer has dealt himself a Full House! The packets are then gathered up, shuffled, and cut by the spectator, and honestly dealt again. This time, the performer has dealt himself a Royal Flush! This works no matter which hand is called for. You will always use twenty cards for a four-handed game. There are no calculations or systems to worry about. You will learn the very simple set-up in as little as one read of the eBook. It is that direct. You can ask for the wanted hand before or after the spectator shuffles the pack. This gambling routine is so simple that a beginner can perform it, but strong enough that David uses it in his professional working repertoire. Also included is a similar routine called, "Not Quite Immortal" in which a Royal Flush is dealt, but the spectator decides (no force) on the suit of the royal flush. 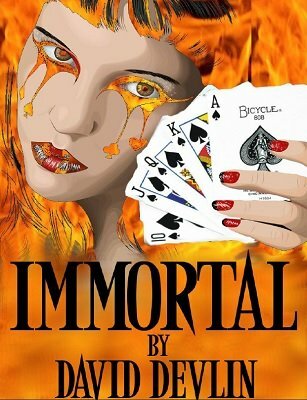 If you enjoy gambling routines, David Devlin's Immortal is a must!